The TRACE Collective are performance artists known for staging various avant-garde arts events in the Welsh capital. Usually based in an unassuming terraced house in Adamsdown, the group have been invited to perform a series of ‘interventions’ on the Maes (or field) of Cardiff’s National Eisteddfod, Wales’s premier arts festival. 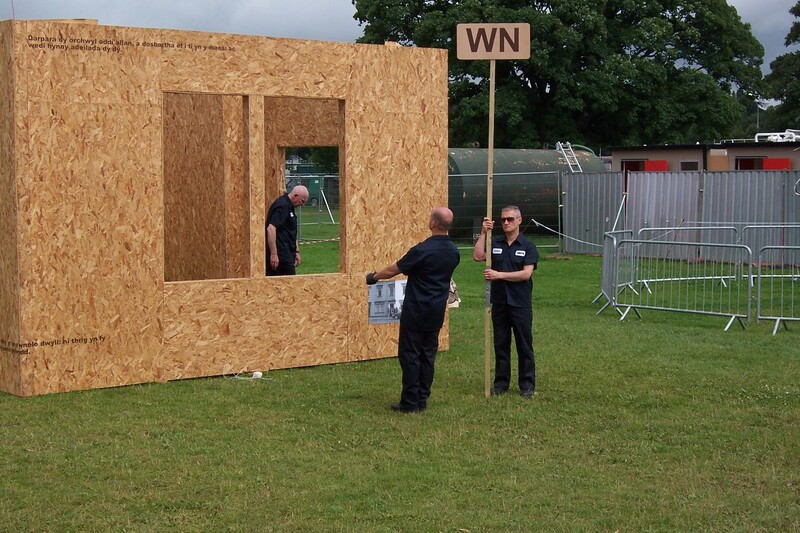 This will utilise a specially constructed scale replica of TRACE’s home, which the artists will erect before the Eisteddfod crowd, allowing audiences full access to the group’s preparatory work as well as the performances themselves. The National Eisteddfod has a strong record when in comes to supporting performances of this kind. Back in 1977, it staged one of the first exhibitions of performance art in Wales, an event made infamous after it was deemed a “shocking waste of money” by Welsh MPs. In recent years it has played host to similar collaborations with groups like Cywaith Cymru. Though not always to the taste of the traditional eisteddfodwyr, these events nevertheless reveal a modern face to this ancient festival, and show that the Eisteddfod is more than just poetry and choirs. Indeed, one could argue that its all in keeping with the vision of Iolo Morgannwg, the founder of the modern Eisteddfod, who introduced the most fanciful performance of the them all: the Gorsedd ceremony, with its bards in white, druidic robes gathered around a prefabricated stone circle. Among the artists performing on the Maes during Eisteddfod week are Andre Stitt and Mike Pearson. Belfast-born Stitt, TRACE’s Artistic Director, is best known for his 2003 performance White Trash Curry Kick, in which the artist intended to kick a take-away carton through the streets of Bradford. (The event was eventually cancelled due to crowd safety fears.) Pearson, meanwhile, is one of the founding-members of the legendary Brith Gof, the radical theatre company whose dramatic take on national identity broke new ground in Wales during the 1980s and ‘90s. Their involvement in this project, together with contributions by others such as Beth Greenhalgh, Eddie Ladd, Lee Hassall and Phil Babot, augurs well for what promises to be an innovative – if challenging – series of performances. TRACE: Displaced – Gwaith/Work will be performed at the National Eisteddfod from Sat 2 Aug till Sat 9 Aug 2008. This entry was posted on August 1, 2008 by Huw David Jones and tagged Andre Stitt, Beth Greenhalgh, Brith Gof, Eddie Ladd, Huw David Jones, Lee Hassall, Mike Pearson, National Eisteddfod of Wales, Phil Babot, TRACE.